The Cherub Choir is our youngest vocal group at Wesley. 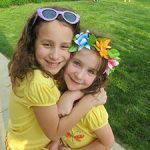 The children are ages 3 (by September 1) through 4 years old. The Cherub Choir meets on Wednesday evenings from 5:45 - 6:15 in room 202. 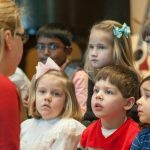 The Cherub Choir is under the direction of Kelly Snyder and the choir sings once a month in one of the Sunday morning worship services throughout the school year. If your child likes to sing praise to God and have fun at the same time, come and join us! For more information, please contact Brenna Martin, bmartin@wesley-umc.com. Join Wesley UMC Cherub Choir and Sonshine Singers on Facebook! The Sonshine Singers is the vocal choir for Kindergarten and First graders. The Sonshine Singers meet on Wednesday evenings during the school year from 6:20 - 6:50 in Room 202. The choir sings on a monthly basis in worship services during the school year. Kelly Snyder is the director of the Sonshine Singers. For more information, please contact Brenna Martin, bmartin@wesley-umc.com. 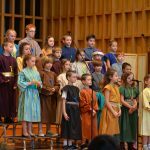 Wesley Singers is the choir for Second Graders - Fifth Graders. They meet on Wednesday evenings during the school year in the Choir Room from 6:30 - 7:10. Wesley Singers sing once a month at one the Sunday morning worship services. They also stage and perform a short musical annually. Choir members begin to explore the world of music, working with basic music theory, and the use of various techniques designed to improve the physical and mental approach to singing. This choir is directed by Assistant Director of Music Ministries, Brenna Martin, bmartin@wesley-umc.com. Please contact Brenna for more information. Hand held choir chimes are rung similar to handbells. 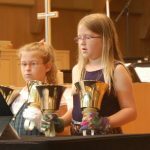 The Chimes of Glory is open to students in 3rd - 5th grades and offers beginning ringing techniques. The choir rings monthly in one of the Sunday morning worship services. Rehearsals are on Wednesday evenings from 5:30 - 6:30 in the Chapel. The Chimes of Glory are under the direction of Gail Welk. For more information, please contact Brenna Martin, bmartin@wesley-umc.com.